AV over IP has become quite a buzz word in the audio-visual industry. This technology is not new and one of the more popular video coding protocol: H.264 has been around since the late 1990’s. This video coding standard has been used extensively used in Blu ray Discs, Internet Video services, like YouTube, and CCTV (Closed Circuit TV). The audio-visual industry has not really been attracted to the AV over IP technology in the last 20 years due to many AV systems’ signal distribution being analog IE: VGA, Composite, Component Video and many more. Cost of hardware and installation complexity were also major dis-tractors. The wide spread adoption of digital signal distribution via HDMI, DVI and DisplayPort cabling over the last 10 years had created a major problem. These digital cables had relatively short cable runs, generally only working correctly to around the 10 metre mark. Installing these digital cables in conduits and cableways became another issue, as the cable could not be field terminated and molded connectors were bigger than most of the popular cable conduits diameter sizes. In 2010, the HDBaseT alliance provided an excellent solution for digital signal distribution over simple category cable. HDBaseT technology products allow digital signal distribution up to 100 metres, field termination is a simple RJ45 Connector and installing CAT cable in normal construction conduits is very achievable. As of 2017, HDBaseT technology is used extensively in the AV, Automotive, Industrial and Consumer industries. With advent and adoption of Gigabit and 10 Gigabit Ethernet since 2010, the possibilities of AV over IP have become a reality due to the increased bandwidth on these networks. It was just a matter of time before the major AV manufacturers started developing and manufacturing the hardware. That time is now. 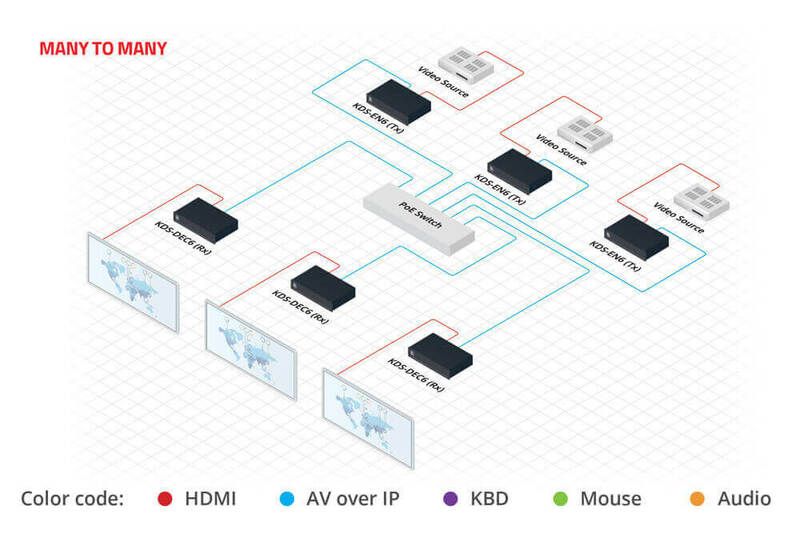 AV over IP: How does it work ? AV over IP technology consists of an encoder, decoder and an IP network. Encoders “convert” the digital signal into data packets to be sent across an IP network. The digital signal is compressed during this process. The decoder will convert this compressed data back to it’s uncompressed form, ready to be sent to a digital display. In it’s simplest form the IP network can consist of a single category cable between the encoder and decoder, but generally will have multiple switches and category cables to make up the signal distribution paths. HDBaseT is a great technology and will continue to serve the AV industry with solutions for digital signal distribution for years to come. BUT, the AV and IT worlds are fast merging, and more and more AV products are IP enabled. These products are using IP networks for audio distribution, communication, control, scheduling, maintenance and now audio-visual signal distribution. Leveraging existing IP network infrastructure, it is possible to send AV signals across large distances. It is also possible to send one AV source to many displays without having to use AV matrix switchers or distribution amplifiers. This also eliminates the need of separate AV cabling for signal distribution. The control of the AV over IP appliances is done via traditional AV control systems or via embedded web interfaces. Monitoring of this equipment can be done via the customer’s existing LAN and/or WAN. In the short time I have been investigating AV over IP technology, I have noticed that the manufacturers have different ideologies and signal distribution methods. Some manufacturers have gone the route of proprietary video compression coding, thereby locking in the customer to the manufacturer’s product. Other manufacturers have decided to use the H.264 Video coding standard, which allows many other encoders and decoders to be used with their equipment. I have even come across a manufacturer that produces various different models that provide proprietary and H.264 video coding. This particular manufacturer also provides different models for various resolution and bandwidth requirements. I have also seen resolution/bandwidth control via web interface of other manufacturers. Most manufacturers have encoders and decoders as separate devices, but there are a few that produce one appliance that can cater for both encoding and decoding. This distinction is made via the device’s web interface. Pricing of AV over IP products has reduced dramatically in recent times due to increased adoption. It has now become a very viable option for medium to large audio-visual signal distribution systems. In some cases, AV over IP is more economical than traditional HDMI, HDBaseT and Matrix switcher systems. Where this is very apparent is when a system has a large amount of displays but only a few sources. Traditionally if you purchased a matrix switcher, it has as many inputs as outputs IE: 16×16, 64×64 etc. Regardless of how many inputs are utilized, you pay for the processing capability of the entire switcher’s inputs and outputs. So, connecting 3 x digital signage players to 64 x displays would mean you would have to purchase a 64 x 64 Matrix switcher. Cable runs also need to be from sources to matrix switcher and then to displays. AV over IP is changing the audio-visual industry forever and is here to stay. This will become the standard for audio-visual signal distribution in the not to distance future. IP network knowledge is critical for successful deployments of AV over IP. AVC has been up-skilling our technical personnel to make sure we are ahead of the curve and ready for these exciting times.